Who played the 3D Samsung Galaxy S III Cinema game on Saturday night? There seems to be no way to escape the Samsung Galaxy S III. At the Olympics, the Samsung Galaxy S III has been a prominent participant. Now, even a trip to the movies can't seem to give you a moment without that 4.8 inch HD Super AMOLED screen staring you right in the face. 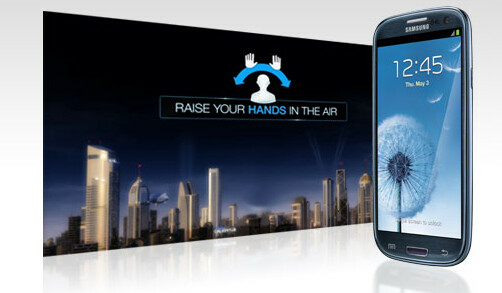 Starting on Friday and running almost every day until August 16th, the 3D Samsung Galaxy S III Cinema game will be shown on movie screens across the nation. No, it won't be seen in every theater and before every movie. Samsung has graciously put up a search tool that will allow you to punch in your zip code, city and State, and the date you are going to the talkies. The site will display a list of theaters and movies that will feature the interactive game that lets the movie audience participate. Based on the website, it looks like the game has the audience raising their hands and moving them to the left or right. As far as what kind of movies you might find this being played in front off, it will have to be a movie with a 3D option. In the South Florida area, there were two movies that displayed the game on Saturday night, the Dark Knight Rises and Step Up Revolution. Both would figure to attract young teens and young adults who might find the game fun, and could have some disposable income for a Samsung Galaxy S III purchase. To find out where you might find the game in your area, click on the sourcelink. Anyone out there lucky enough to be in a theater where the 3D Samsung Galaxy S III Cinema Game was played? If so, kindly share with us some details like how the game worked, the movie you saw and you thoughts on it. Just type your comments in the box below. Samsung is not forcing you to buy their fone, they are just marketing their product, get a life! U sound like an 8 yr old. I'm over 3D and I wish it would just go away. And the S3 is an amazing phone but this advertising ploy sounds lame. Its definately a legendary device.!! people said Gs2 was legendary, people say iphone was legendary, now this is "legendary" they all are great devices but none of them qualify as truly "legendary"
well, I saw batman last night. I didnt see the advert. Oh well. Didnt bother me, Batman was still one hell of a movie.